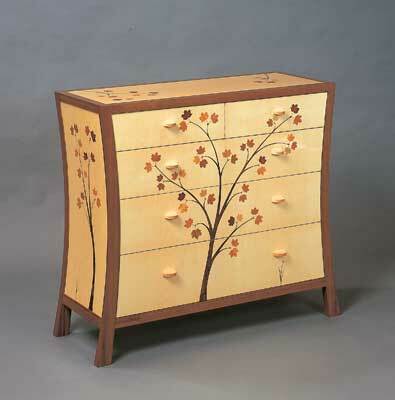 This chest of drawers is a development of ideas first explored in a writing bureau that I made a few years ago. My aim was to simplify the design but retain sufficient curvature to maintain flow and movement. Developing proportions appropriate for the shape and compact size was a key consideration. One of the classic pieces that I looked to for inspiration was a small, exquisitely proportioned bachelor's chest, constructed around 1730. I went directly from concept sketches, showing the general shape and proportions, to full-size drawings. Although their main purpose is to provide a construction rod, the preparation of the full-size drawings also gives an opportunity to experiment with certain design details. I find that it is much easier to appreciate the impact of subtle changes to the shapes of curved components when I can look at them full-size. The legs are fairly simple, 1in (25mm) thick, a gentle curve on the front, and a slight taper in width from 1in (25mm) at the top to 12 1/32in (42mm) at the bottom. Cutting from solid would be an easy and appropriate way to make them. After all shaping is complete, two operations are needed to finish the legs: machining the grooves for the side panels and then drilling the holes for the metal dowels that attach the legs to the top and bottom carcass components. 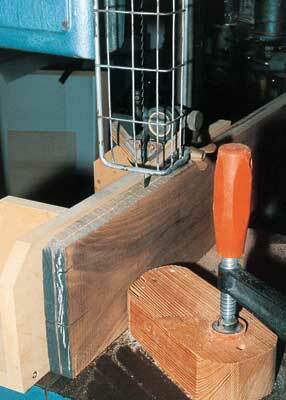 It is better to make the side panels before you groove the legs, to ensure that the groove will provide an exact fit. Similarly the dowel holes should be drilled after the top and bottom panels are ready. One of the design requirements is that the walnut (Juglans sp.) edging on all the components should appear to form a continuous frame around the whole carcass. This means having a good colour and grain match. The top surface will include some walnut veneer and if the walnut planks and veneer are a poor match, you may want to consider veneering the legs. Other solutions are possible. For example, replacing the veneer on the top with a solid lipping. However, that would mean horrible three-way mitred corners meeting at an odd angle and no obvious, simple way of making a strong mechanical joint. As always, the best approach will depend on the materials you have and the results you want to achieve. Mark out the positions of the notches for the legs at each corner of the top and bottom panels using the rod to ensure the angle is accurate. I used the table saw to cut as much of the length of each notch as possible and finished by hand. The angled face - from front to back - was rough cut by hand and finished with a sharp chisel using an angled wooden block as a guide. Drill a 3/8in (10mm) hole in the centre of each notch to take the metal dowel. The top and bottom panels are now set aside until the marquetry panels are ready. First laminate two layers of 5/32in (4mm) birch ply to provide the core. Cascamite (urea formaldahyde glue) is an appropriate adhesive for curved work. The sycamore marquetry panel on the outside and a balancing veneer on the inside face will be added later. If the face is to be covered with a simple veneer without marquetry, then I might prepare the panel core along with the surface veneers in one step. However a marquetry panel represents a serious amount of work and I take a more cautious two-step approach. Note the use of electrical insulating tape to hold the leaf in position while stabbing out the sycamore background. I used to use a staple which can leave visible holes in some veneers. I now also make all cuts from the back - glue side - of the substrate. This produces a crisper cut on the top surface. Although I was happy with the quality of the marquetry before, these changes require no extra effort and produce an improved result - and it's not often these two things coincide! I used Cascamite and a vacuum pressing system to glue all the marquetry panels to the appropriate carcass component. The edgings and banding were hammer-veneered with traditional hide glue. Note that the 1in (25mm) wide walnut banding around the top marquetry panel must be added after the carcass is glued up. When you glue on the top marquetry panel, keep as much of the area to be banded glue free in order to make it easier to trim back the excess sycamore. Glue the legs, side panels and top and bottom to make the carcass. I made dowels from 3/8in (10mm) threaded steel studding and used a two-part epoxy to give a good bond to both wood and metal components. Use a squaring rod to ensure the carcass is true. Once the carcass is together you can add the walnut banding to the top. A solid sycamore frame that consists of front and back rails, runners and guides supports each drawer. The construction is fairly conventional but because of the curved carcass, the frame width and guide position are different for each drawer. An accurate rod is definitely helpful when doing this. First make a frame for each drawer consisting of front and back rails joined together by the runners. The top drawer frame will also need a muntin at the centre. I used biscuit joints and found them to be very quick and accurate. If you fit dust boards then you will need to groove the inside faces of the rails and runners. Glue up the frames and put to one side while you prepare the supports that will carry the frames in the carcass. In a conventional chest of drawers the rails and runners are supported in grooves machined in the carcass sides. This is not possible with this piece because the side panels are too thin. I rejected the option of attaching battens to the side panels to carry the runners for practical and aesthetic reasons. I like to have a smooth, uncluttered appearance for all surfaces, including those that will not routinely be on display. Matching pairs of spacers, one left and one right, are used to hold the rail and runner assemblies at the correct height, where the first spacer is in place. These spacers are made from two additional laminated side panels using 1/8in (3mm) birch ply faced front and back with a sycamore veneer that will eventually be glued into place. The width of the spacers is adjusted to provide a snug push fit in the gap between the two legs. You need to carry out a dry assembly in order to establish the correct location of the drawer guides on the rail and runner assemblies. The thickness of each guide will need to be adjusted so that the drawer will clear the carcass side by 3/64 to 5/64in (1 to 2mm) at the narrowest carcass width for each drawer and also provide a stable support platform for the spacers. Start by inserting the rail and runner frame for the bottom drawer into the carcass. It should project 3/64 to 5/64in (1 to 2mm) above the carcass aperture to give some clearance between the carcass and the drawer - use thin spacers underneath the frame to adjust the height as necessary. Now build up the support system by adding the appropriate side spacers and drawer supports as you progress towards the top. The very top spacer may need a bit of fine planing and edge bevelling to fit accurately but the final result should be a seamless appearance to the carcass sides, with the drawer supports held accurately and securely in place. The drawer material is 5/16in (8mm) solid stock: walnut for the sides, sycamore for the front and back. The visual contrast between the sides and the front continues the walnut and sycamore theme from the exterior carcass. 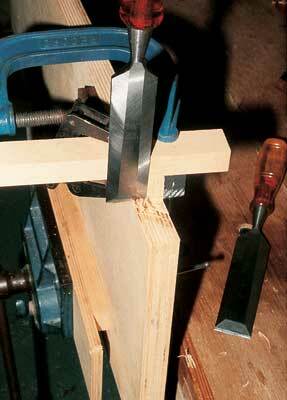 Construction is with conventional through dovetails. 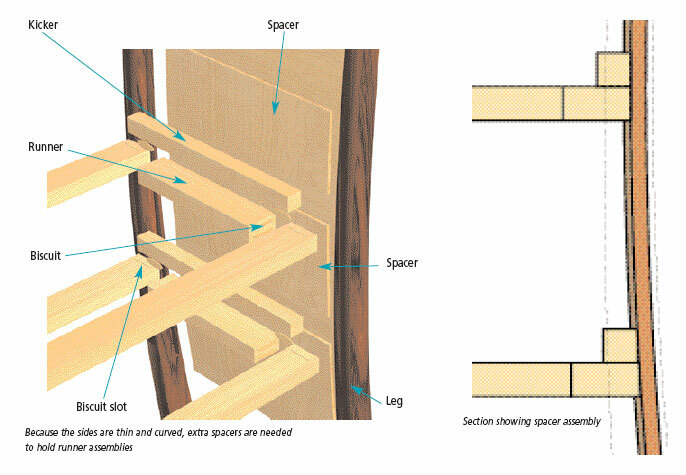 False fronts will eventually cover the exposed joints and therefore lapped dovetails at the front are not necessary. The drawer bottoms are 1/8in (3mm) birch ply veneered both sides with Cedar of Lebanon (Cedrus libani). They run in grooves at the front and sides and extend beyond the back of the drawer as in the traditional method used for solid bottoms. This method allows the bottoms to be removed for final fitting of the drawer to the carcass aperture and will also make it easier to fit the false front. 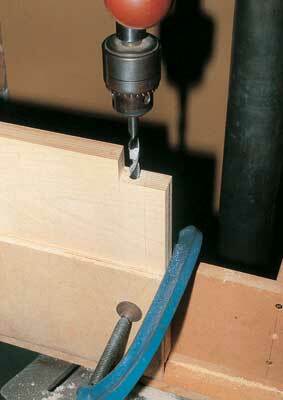 The carcass opening is used to mark the curved shape directly onto the drawer front blanks. 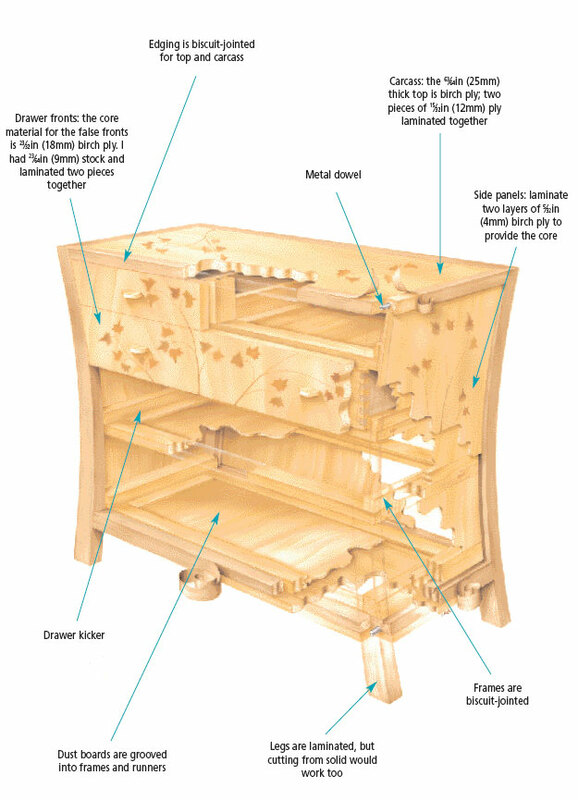 Start by supporting the bottom drawer in front of the carcass with a 3/64in (1mm) spacer between the carcass and the bottom of the drawer front to allow for clearance - a sash clamp running from the front to the back of the carcass will hold it in place. Mark the side profiles. 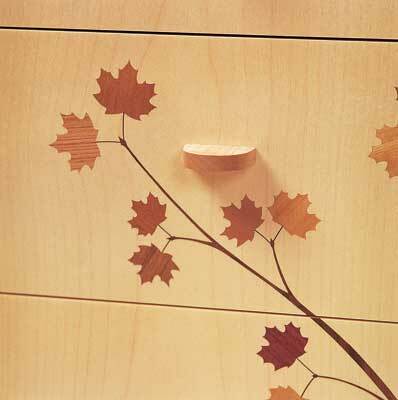 After cutting and shaping the side profile, wedge the bottom drawer front into the carcass to provide an accurate location reference for the position of the next drawer. Continue this process until you reach the top drawer blanks where you need to fit both the side profiles and the exact height. 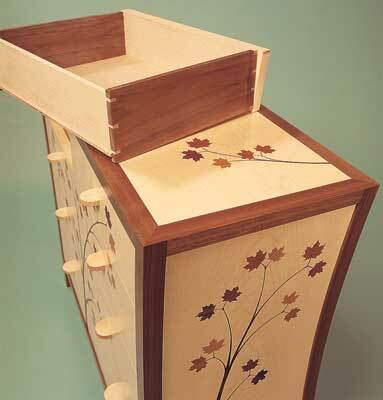 With the drawer fronts fitting the carcass opening you can now complete the front marquetry. It is important to remember that the marquetry panel on the front will need to be balanced with sycamore veneer on the back to keep the drawer fronts from warping. 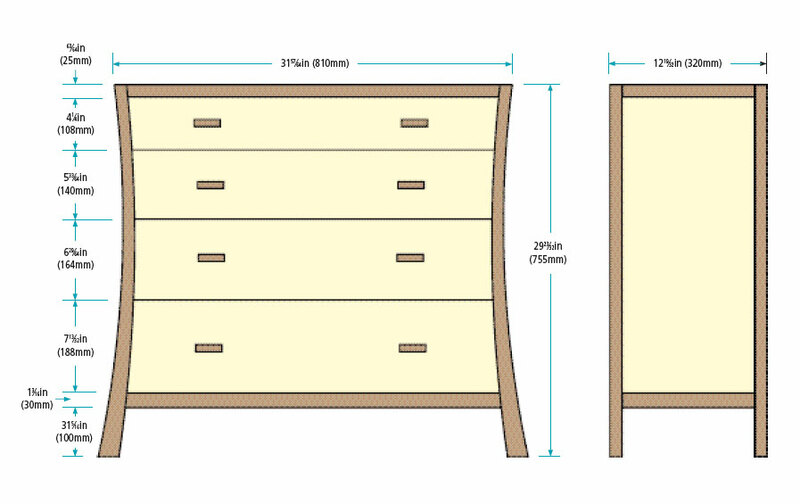 The 5/16in (8mm) solid sycamore drawer piece, that the false front will be attached to, will not hold the front stable. All that's left is to attach the fronts to the drawers, see page 165, add drawer pulls, drawer stops, a back and, of course, clean up and finish. The back is inset about 5/64in (2mm) into the carcass and screwed to the back rails and some small walnut strips that are glued and pinned to the carcass sides. The drawer stops are also on the back rails. I find it easier to fit them from behind and there is also less stress on the drawer if it is pushed in with excessive force. The finish is clear polyurethane used in a similar manner to Danish oil. Dilute with about 30% white spirit, apply with a cloth and then wipe off the excess. Allow to dry overnight and apply as many coats as necessary to get the build and finish you want. The finish builds slowly, so persevere. The reward is a finish that is durable, has good resistance to heat and alcohol - and looks great! "I find it easier to fit drawer stops from behind"
A secure set-up is essential. Safety apart, it also ensures that the groove will be accurately cut. Secure the workpiece so that the groove can be made in one continuous pass. I left the leg overlong at the top and screwed it to the baseboard in the waste at the end. The other end can be clamped without interfering with the cut. Ensure reasonable contact between the router fence and the curved leg profile - I screwed a curved wooden guide to the router fence. Keep the router stable on the thin workpiece - I fixed 1in (25mm) thick outriggers to each side of the router base plate with double-sided adhesive tape to keep the router bit square over the whole cut. Attaching is easy. Keeping accurate alignments is the hard part. 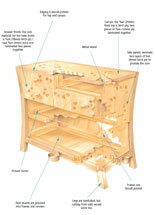 I don't like seeing screws on the inside of drawers although they are often used to attach false fronts. I used small blind dowels to preserve alignment and glued the fronts on. Each drawer had four small brads driven into the front to mark the dowel positions. The heads were cut off. The drawer bodies were put back into the carcass and pushed in a little deeper than normal. Then I wedged the drawer fronts in position in the carcass with an even spacing between all components, about 3/64in (1mm). Each drawer was then gently pushed out so that the brad heads marked the dowel position on the drawer front. Press-gang someone to support the drawer fronts as you push from behind to ensure that you don't end up conducting a salvage operation with a heap of fronts on the floor. Drill the dowel holes, dry assemble to the drawer bodies and refit into the carcass to check alignment before gluing.